Ocean Beach often referred to as OB, is one of San Diego's best beach communities. This funky seaside town sits between the Pacific Ocean to the west and the more upscale enclave of Point Loma on the hill to the east. 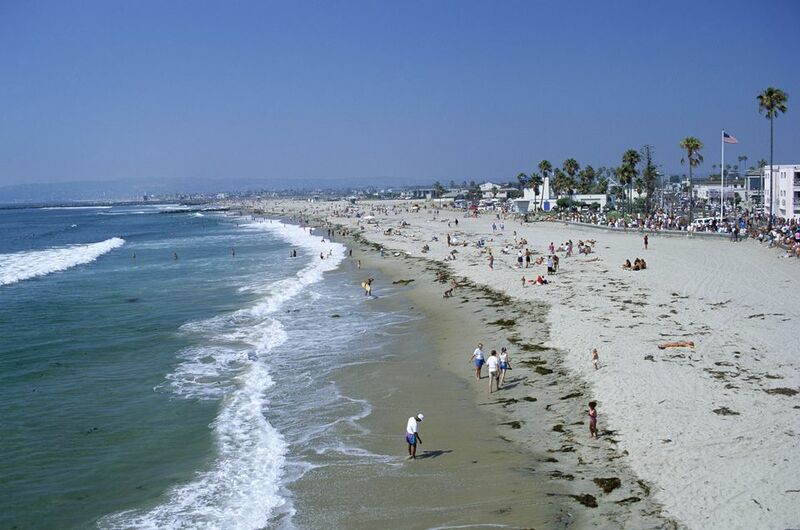 It is laid-back and less rowdy than the San Diego neighborhoods of Mission Beach and Pacific Beach a few miles north. Although Ocean Beach sits on prime waterfront real estate, the neighborhood still exudes a small-town atmosphere, making it an ideal place to live and visit. Where other beach communities have embraced commercialism, Ocean Beach remains fiercely independent and skeptical of wholesale change. You're more likely to see a food co-op than a fast food chain. The Ocean Beach community is so tight-knit that residents often refer to themselves as OBceans, pronounced "oh-BEE-shuns." Ocean Beach was given its name by developers Billy Carlson and Frank Higgins in 1887. The beachfront was the main attraction, although in the early 20th century, getting to Ocean Beach was a bit of a trek. Another draw was Wonderland, an amusement park at the northern end of the neighborhood that was washed away in 1916. Cottages, bungalows, and apartments were built through the years and attracted (and continue to attract) students, surfers, and free-spirited types. OB was somewhat isolated from the rest of the city until Interstate 8 was built in the mid-1960s.​ Ocean Beach is fondly looked upon as the neighborhood that time forgot, and it still has that hippie vibe—a carryover from the 1960s and '70s that never really left. People head out to OB for the nice, wide, swath of sand. There's also the Ocean Beach pier—the longest pier on the West Coast—where you can try your hand at pier fishing. If you have a four-legged friend, go to Dog Beach, just north of the main beach, and unleash your pup to romp in the sand and surf. Or, stroll along Newport Avenue, the main drag in OB's business district, and take in the small-town feel. There are many great places to eat in OB. BO-Beau Kitchen + Bar is a romantic spot as it offers upscale French fare in a cozy, candlelit dining room. If you prefer something casual, try the juicy, loaded burgers at Hodad's, fresh fish tacos at South Beach Bar & Grille, or a slice of pizza and some San Diego craft beer at Pizza Port. Kaiserhof is known for its authentic German food and brews while Old Townhouse Restaurant is the best for diner-style breakfast (especially when recovering from a long night out). And if you're into healthy eating, definitely make your way to the Ocean Beach People's Organic Food Cooperative and order a homemade wrap from the deli. OB is a boho beach community, so what else can you expect but dive bars, right? Winstons Beach Club is your place for live music—usually some sort of cover band in the Dead/Reggae/Jam band vein. Comedy shows are also regularly scheduled there. The Catalina Lounge is your popular, friendly dive bar, as is the Tilted Stick. The Arizona Cafe has cleaned up its act and is now a cool hangout with pool tables and big TVs for watching sports. When it comes to shopping in OB, don't miss The Black, a smoke shop that is also a neighborhood institution. Kind of a head shop/novelty/record store, The Black is like going back in time to the hippie decade. Ocean Beach Antique Mall on Newport Avenue is where to go for unique vintage finds and home goods. Sunshine Daydreams is a little boho-chic clothing boutique, and the Black Bead is a mecca for jewelry hobbyists. Take Interstate 8 to its western terminus at Sunset Cliffs Boulevard. Continue on Sunset Cliffs as you cross a couple of OB's main thoroughfares, West Point Loma Boulevard, and Voltaire Street. Turn right at Newport Street to drive down OB's downtown district. At the foot of Newport are the beach and the pier.